A Celebration of the Senses… requires a comprehensive sense of taste, careful attention to detail and a remarkable ability to orchestrate all these elements into a perfect event. You will find every opportunity to celebrate worldly pleasures in many unique ways. Local priests can perform the Greek Orthodox ceremony in the chapel of the St. Anargyroi in the Resort. 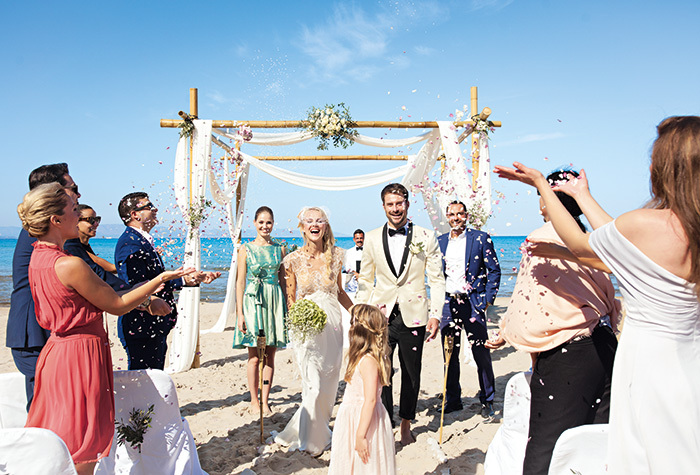 Exchange your vows under a flower-decked beach gazebo or with the backdrop of the resort chapel. The Olympia equestrian centre is on-hand for those who want to arrive by carriage or on horseback. With three hotels, there’s just the right accommodation for everyone but don’t miss the chance to sample a Mandola Rosa villa for your honeymoon!